As part of its international research project “Challenges and Opportunities of Economic Integration within a Wider European and Eurasian Space”. IIASA conducted three studies that produced policy recommendations for three key sectors determining the potential for EU – EAEU cooperation: mutual foreign direct investment, transcontinental transport corridors & logistics, and harmonizing technical barriers to trade and sanitary-phytosanitary measures. On 6 June 2018, IIASA presented three reports resulting from this research at a high-level conference in Moscow: “Prospects for a deeper EU – EAEU economic cooperation and perspectives for business”. The event was co-organized by IIASA, the Eurasian Economic Commission (EEC), Russian Union for Entrepreneurs and Industrialists (RSPP) and the Association for European Businesses in Russia (AEB). Leading policymakers, top-level business executives and renowned researchers from the EU and EAEU came together to discuss both the opportunities and threats that EU-EAEU integration might bring to the business communities in both regions over the next years. Participants also examined the challenges that need to be overcome in order to move the Lisbon-to-Vladivostok agenda forward. Existing challenges and problems in the development of economic integration within the European and Eurasian space. Opportunities and potential for engagement in overcoming mutual restrictions and reducing risks and costs for cooperation related to third-country sanctions. Potential business opportunities from increased integration of EU and EAEU integration: implementation challenges. Development of cooperation between the EU and the EAEU in priority areas (transport, non-tariff barriers, foreign direct investment). The research on technical regulations and standards highlights that the EAEU is already implementing many EU standards as the basis for reforming and modernizing its former GOST regulations and standards. In addition the EAEU is adopting many standards of the international standards organizations (ISO, IEC, ITU), which work very closely in partnership with the European standards organizations (CEN, CENELEC, ETSI), such that international and European standards are to a large degree identical. This means that the legal and technical infrastructure for non-tariff barriers of the two parties is already converging. This makes non-tariff barriers a potentially fertile field for cooperation between the EU and EAEU, which in turn could mean easier access to markets and increased mutual trade. In this case, the potential format and extent of cooperation could extend to include a Mutual Recognition Agreement (MRA) on Conformity Assessment, through to the most ambitious formula (in EU practice) of the Agreement on Conformity Assessment and Acceptance of Industrial Products (ACAA). Such arrangements would in principle ideally form part of a free trade agreement. Such scenarios can be technically specified, but of course they would have to rely on demanding political conditions which today are not satisfied. The research on foreign direct investments highlights that investment flows between the EU and Russia, as well as other EAEU member countries, used to be among the most important areas of East-West economic relations. However, in the recent years, the Ukrainian crisis, mutual sanctions, currency fluctuations, and a slow regional growth in the post-Soviet space, along with the fall in trade of goods and services, have led to a steep decline in the FDI flows, particularly in case of Russia. Having analyzed investment flows between Europe and the EAEU member countries, as well as the political and economic factors that affect them, the IIASA research team has come up with both short- and long-term policy recommendations on how to stabilize existing foreign capital investment and ensure its growth in the future. These include, among others, the adherence to already accepted international commitments and disciplines, streamlining and simplifying administrative procedures, a gradual opening of government procurement for foreign-owned companies, and, of course, more transparency. The research on transport highlights that the ambitious “Belt and Road Initiative” (BRI) is expected to change the nature of connectivity across the Eurasian continent and to bring the traditional and rising markets of Europe and Asia closer together. Over the last four years, cargo flows from China to Europe along the railroad routes through the EAEU, and vice versa, have increased twofold every year. That makes 147,000 containers in 2016. IIASA’s study forecasts further growth of the EU–China cargo turnover carried by railway transport through EAEU countries and sheds some light on the bottlenecks, both in the soft and hard infrastructure, that will need to be overcome to link the EU to China’s and the EAEU’s cooperation on the Silk Road Economic Belt. Among them are differences in gauges, the discrepancy of the requirements established by regulatory enactments (e.g. length of trains), insufficient level of procedural harmonization, and the low development of the Polish railway infrastructure and cross-border points between Belarus and Poland. Alexander Shokhin, President of the Russian Union of Industrialists and Entrepreneurs (RSPP); Tatiana Valovaya, Member of the Board (Minister) for Integration and Macroeconomics, the Eurasian Economic Commission (EEC); and Pavel Kabat, Director General and CEO, International Institute for Applied Systems Analysis (IIASA), addressed the audience with Welcome remarks. 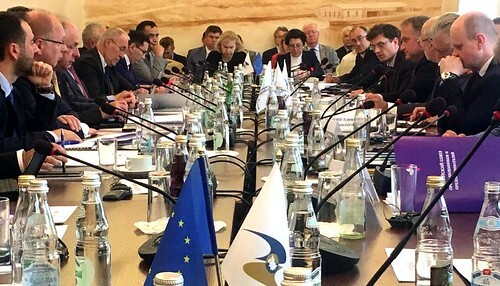 In 2013, IIASA, together with its partners, began the international research project “Challenges and Opportunities of Economic Integration within a Wider European and Eurasian Space” (#InEurasia) with the aim to study the conditions and potentials of the creation of a common economic space between the European Union (EU) and the Eurasian Economic Union (EAEU) in the context of the Greater Eurasian space. Over the times of the geopolitical crisis which started soon thereafter and have continued until now, IIASA has become a unique platform, where high-level officials and experts from the European Commission (EC), the Eurasian Economic Commission (EEC), the EU and EAEU member states, as well as other Eurasian and Asian countries, could meet and discuss the challenges and opportunities of (re-) establishing closer economic relations and the “integration of integrations”.